Free and open-source software (F/OSS, FOSS) or free/libre/open-source software (FLOSS, FL/OSS) is liberally licensed to grant the right of users to use, study, change, and improve its design through the availability of its source code. This approach has gained both momentum and acceptance as the potential benefits have been increasingly recognized by both individuals and corporations. FOSS is an inclusive term that covers both free software and open source software, which despite describing similar development models, have differing cultures and philosophies. Free software focuses on the philosophical freedoms it gives to users, whereas open source software focuses on the perceived strengths of its peer-to-peer development model. FOSS is a term that can be used without particular bias towards either political approach. Free software licences and open source licenses are used by many software packages. While the licenses themselves are in most cases the same, the two terms grew out of different philosophies and are often used to signify different distribution methodologies. Below are links to the FOSS software located on this server. ProjectLibre is the open source replacement of Microsoft Project. It has been downloaded over 1,400,000 times in over 210 countries. ProjectLibre was awarded ComputerWorld's "Best of Open Source" software. Create tasks and milestones. Aside from the start date and duration, every task may have priority, cost New in 2.7, color and fill pattern, text notes and user-defined custom fields. Organize tasks in a work breakdown structure. Hierarchical tree where progress, dates or costs of lower level tasks is summarized on the higher levels. Summary tasks can be collapsed to hide tasks which are not important at the moment. Draw dependency constraints between tasks, like "start X when Y finishes" and GanttProject will take care of enforcing these constraints. You can add a lag or use other types of constraints. Create baselines to be able to compare current project state with previous plans..
PERT chart for read-only view can be generated from the Gantt chart. Navigation buttons to move to next/previous/random frames in the presentation, you can use custom bitmaps for these buttons (full transparency/alpha channel support). Callouts and shapes for displaying text explanations. The inbuilt Callout Editor is used to create custom shaped callouts as you want. 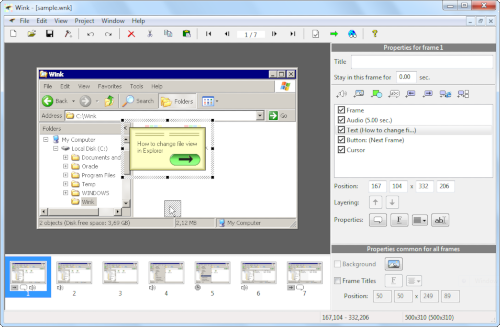 Intuitive drag-n-drop editing of the frame, callout, cursor, navigation buttons and the title elements. Advanced features like templates, cursor editing, palettes, background images, control bars & preloaders for the flash output etc. Completely PC and Web ready with exports to PDF, HTML, SWF and EXE formats. Innovative compression techniques applied to reduce filesize of output Flash file. Generated flash file plays in Flash players from version 3 and above, giving you widest array of target audience. Uncompressed output to allow you import the output of Wink into other Flash editors. eXe grew out of the New Zealand Government Tertiary Education Commission's eCollaboration Fund and was led by the University of Auckland, The Auckland University of Technology, and Tairawhiti Polytechnic. It was later supported by CORE Education, a New Zealand-based not-for-profit educational research and development organisation. It has also been greatly assisted by a global group of participants and contributors. CourseLab is a powerful, yet easy-to-use, e-learning authoring tool that offers programming-free WYSIWYG environment for creating high-quality interactive e-learning content which can be published on the Internet, Learning Management Systems (LMS), CD-ROMS and other devices.